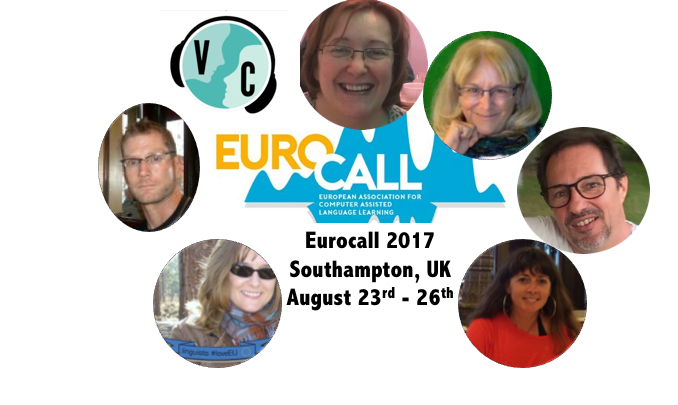 We’re checking into the conversations at Eurocall 2017 with onsite buddy Teresa MacKinnon. You can join into these conversations by signing up using this form. The annual Eurocall conference is the main event for those involved in computer-assisted language learning (CALL) in and beyond Europe. This year it is being held in the United Kingdom, where it is hosted by Southampton University, formerly the home of the Languages, Linguistics and Area Studies (LLAS) the home of the subject network for languages in UK HEIs. This year’s conference theme is CALL in a climate of change and this coincides with a very turbulent period in language provision in the UK. The programme is full of lots of evidence of a vibrant and active community with a good deal of ground breaking research into digital technology uses in the language teaching community. Conference tracks including PhD research, Mobile Assisted Language Learning (MALL), Computer-Mediated Language Learning (CMC) and teacher education. Check out more on the Eurocall Conference site. Virtually Connecting will bring you two conversations. Join this conversation with keynote speaker Steven Thorne and onsite buddy Teresa MacKinnon (@warwicklanguage). The virtual buddies will be Simon Ensor and Helen DeWaard. Join into this post conference conversation and reflection with Shannon Sauro @shansauro (keynote) Kate Borthwick @kborthwick, on site buddy @warwicklanguage and virtual buddy Simon Ensor. If you’d like to JOIN into these conversations. Sign up using this form and we’ll send you confirmation and a followup email with information and links. Thanks for connecting me to the #Eurocall2017 and helping me cross the borders virtually! p.s. My UK visa was denied three times.